There's much more behind cinnamon than just a spice. Cinnamon, through its infusion, can give you properties that promote your health. Therefore, don't avoid kowing what its tea is good for! Cinnamon is much more than just a spice for seasoning and to give a unique flavor to foods. With this plant you can make a tea, which you can use for different therapeutic purposes. Some of these medicinal benefits are widely popular, while others not so much. Therefore, for you to take advantage of all its properties, I'll tell you what its good for. If you suffer from indigestion or slow digestion, cinnamon tea is used as a natural remedy for the stomach, since it contains active ingredients that provide these benefits. In addition, it is known for having properties against loss of appetite. On the other hand, you can consume cinnamon tea to regulate blood glucose, and control levels of LDL or bad cholesterol. Also do not forget that cinnamon, through its infusion provides natural antioxidants to help counteract the effect of free radicals. These same antioxidants prevent fats from oxidizing, from being deposited in the arteries and causing them to clog . Lastly, detoxifying properties are attributed to it, which together with the antioxidants, may be used as a natural remedy to lose weight. However, this is not the only way you can consume cinnamon, to obtain all its benefits for your health. Cinnamon capsules To be consumed as a supplement. Cinnamon tea To prepare cinnamon tea or flavored teas with this spice. 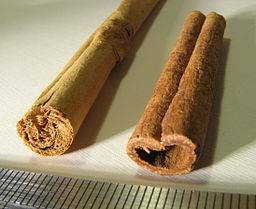 Cinnamon stick To flavor your meals and to make tea. Powdered cinnamon To sprinkle on food and beverages to which they will transfer its particular flavor. IMPORTANT: "What cinnamon tea is good for" 's mission is to keep you informed, but dont ever substitute a medical consultation. Write your comment in "What cinnamon tea is good for"